Chinua Achebe (/?t??nw?? ??t? ?b?/, born Albert Chinualumogu Achebe; 16 November 1930 - 21 March 2013) was a Nigerian novelist, poet, professor, and critic. His first novel Things Fall Apart (1958) was considered his magnum opus, and is the most widely read book in modern African literature. Raised by his parents in the Igbo town of Ogidi in South-Eastern Nigeria, Achebe excelled at school and won a scholarship for undergraduate studies. He became fascinated with world religions and traditional African cultures, and began writing stories as a university student. After graduation, he worked for the Nigerian Broadcasting Service (NBS) and soon moved to the metropolis of Lagos. He gained worldwide attention for Things Fall Apart in the late 1950s; his later novels include No Longer at Ease (1960) , Arrow of God (1964) , A Man of the People (1966) , and Anthills of the Savannah (1987) . 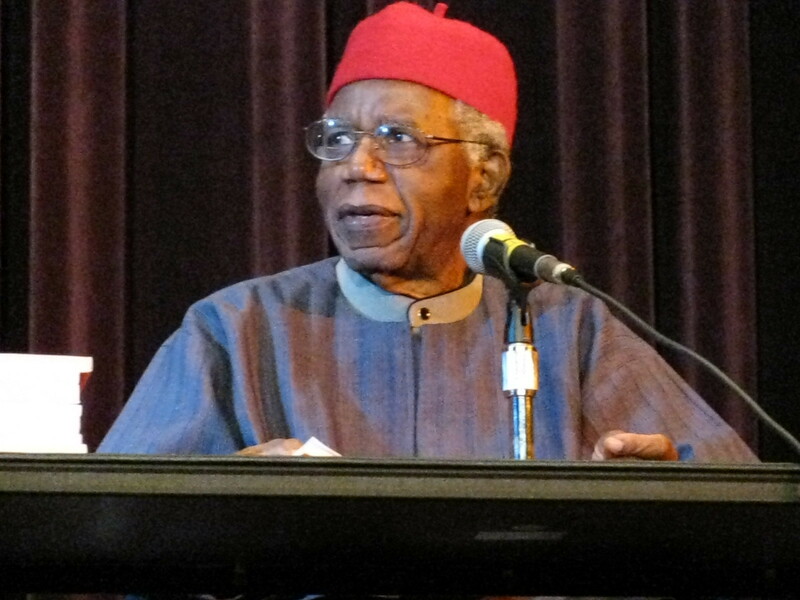 Achebe wrote his novels in English and defended the use of English, a "language of colonisers", in African literature. In 1975, his lecture An Image of Africa: Racism in Conrad's "Heart of Darkness" featured a famous criticism of Joseph Conrad as "a thoroughgoing racist"; it was later published in The Massachusetts Review amid some controversy. Bio from Wikipedia, the free encyclopedia. Photo by Stuart C. Shapiro [GFDL (http://www.gnu.org/copyleft/fdl.html) , CC-BY-SA-3.0 (http://creativecommons.org/licenses/by-sa/3.0/) or CC BY 3.0-2.5-2.0-1.0 (http://creativecommons.org/licenses/by/3.0-2.5-2.0-1.0) ], via Wikimedia Commons.